The traditional skiing holiday is about to be turned on its head - or at least turned round, thanks to a new invention. The innovation challenges adrenaline junkies who may have mastered skiing downhill at frightening speeds to glide through the snow uphill too in what its creators have dubbed "wind mountaineering". A band of Colorado-based skiing fans have devised the parachute-like contraption. 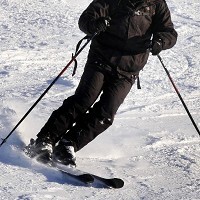 It enables enthusiasts to ski uphill wind-assisted. But before taking on the challenge of uphill skiing, alpine adventurers may want to look into their sports travel insurance first. UpSki's device allows skiers and snowboarders wearing a specially-made harness to go up mountains. The contraption includes a big round sail, measuring 194 sq ft and weighing just four-and-a-half kilos, which can be fitted inside a backpack. The firm is now seeking investment to put its kit into production on Kickstarter. The entire UpSki kit will cost 2,400 dollars (£1,464). The package aims to keep its customers on the ground. It can be deflated immediately, which is vital to remaining safe, particularly in windy or rugged conditions. A harness is donned by the skier or boarder to transmit the UpSki's "pull" to the user and there is a safety release. A "control centre" attaches to the harness and enables users to guide the device to ski uphill using a system of lines. The firm said everyone can enjoy an UpSki, but "prior skiing experience and good fitness is preferable". It said it has spent "countless hours over many years" testing the design in unforgiving environments and scaling big mountains. The device is sewed and assembled in Colorado and the fabric comes from US-based mills. UpSki said: "With skis or snowboard, we harness the wind for an uphill ride - powerful enough for exhilarating speed, yet precise and controllable for manoeuvring and stopping."